Moving in itself is an extremely stressful task. Not only is it time-consuming, but it’s a big change that you and your family are taking on! From the process of buying and selling a home to the endless packing that needs to be done, there are so many moving parts that can make the process of your move a stressful challenge. One of the factors that very few people take into consideration when moving is their children. 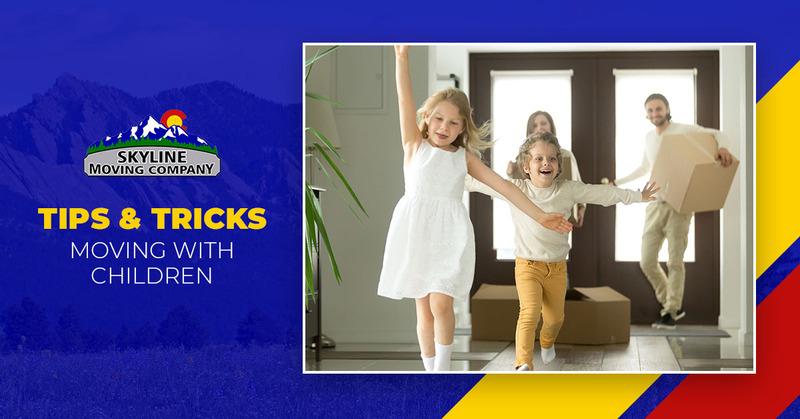 Whether it’s a fast and easy local move to a neighboring community, or it’s a move across the beautiful state of Colorado, moving with children can get complicated. The team at Skyline Moving Company has a few tips and tricks that can help ensure that moving with your children goes smoothly. Check them out. If you have younger children, packing can be a pretty difficult job to get done. Not only are you having to keep an eye on them at all times but, more often than not, their curious minds are wanting to go through the boxes and pull items out. As cute as it may be, this can really slow down the progress on your packing. Taking advantage of your child’s sleep schedule can be extremely beneficial to getting ahead with packing. Sure, it may mean that you have later nights, but you’ll be glad you took advantage of them. Moving is hard, but we often don’t ask for help until we realize that we’re in over our head. If you have children that are older, it’s always good to ask for help and take advantage of the ways that they can make the move go smoother. Even your little ones could be helpful with certain things. Having children help with packing their toys and books is a great way to make them feel involved in the move while also making some progress with packing. While labeling your boxes is always something that you should be doing, adding colored tape or name labeling can be extremely beneficial when you have kids added in the mix. For example, if you have two children, it would be extremely helpful to get two different colors of tape to distinguish one child’s room from the other. That way, when it comes time to move in, you know which boxes need to go to which room. There’s no such thing as starting too early when it comes to moving. While weeks in advance may feel like you’re getting a head start on the process, starting to pack the moment that you place your house on the market will never be something that you regret. Aside from the fact that packing in advance will significantly reduce the amount of stress that you feel while moving, it’s great to know that you have some headway on packing in the case that you find a new home (or sell yours) sooner than initially anticipated. By starting from the moment that you place your home on the market, you’re preparing yourself for anything and everything that comes your way! Moving from your old house to a new home is difficult, and it’s essential that you let yourself feel all of the emotions that come with that. For many children, regardless of their age, leaving the house that they’ve been growing up in is extremely challenging. Have grace with yourself and your children as you move. From taking time to properly say goodbye to your old house to slowly easing into the feel of your new home, it’s always nice to slow down, take a deep breath, and let yourself feel all of the mixed emotions that are guaranteed to come with a move. At times, the tips above can be extremely helpful but, if you’ve got multiple children in the household or more than one under the age of two, it may be time to call in the professionals. The team at Skyline Moving Company can help with your move! From packing to unloading, our team provides you with everything necessary for your move to go perfectly! Contact us today, and we’ll get you taken care of.